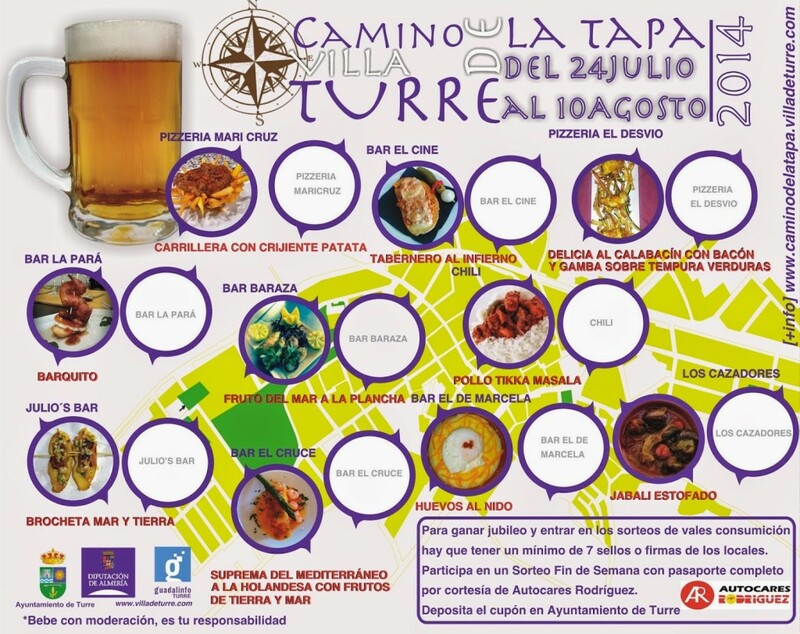 The Turre Tapas Route 2014 kicks off on the 24th of July and runs until the 10th of August. Local bars and restaurants will be serving up their special favourite dishes, and residents can vote for their favourite tapas. You can also participate in a raffle – get at least 7 stamps on your Tapas Passport and drop it off to enter into a free raffle to win a Weekend away. (It doesn’t say where). Pick up your free passport from the townhall or any participating restaurant. Fiestas de Santiago, el Certamen de Flamenco, Torneos de Tenis, Maratón de Aerobic, Zumba, Espectáculo Danza del Vientre, Concierto de la Banda de Música Municipal de Turre, Día de la Bicicleta y como novedad la Feria Gastronómica en el Encuentro de Turreros con la Noche en Blanco y Noche de Rock! This entry was posted in Blog and tagged food, restaurant, route, tapas, turre by David. Bookmark the permalink.